There isn’t much more to say about the Stanley-Bostitch CAP1512-OF than what we’ve already covered in our full review or other “best” lists. A lot of thought has gone into the design of this unit. It’s extremely light, has rubberized feet to keep it stable, built in roll cage, plenty of airflow for most common tasks, and even has a handy LED light that turns on when the unit is ready. Requires no maintenance so you just plug it in and go. The only negatives may be the small tank size and the noise factor. It’s not the loudest compressor out there but definitely not as quiet as some others. Unless you plan on framing a house or using a grinder, you really can’t go wrong with the Bostitch. 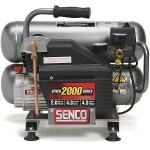 The Senco PC1131 is a fantastic compressor for both DIYer and contractor use. With 2.5 HP peak horsepower putting out 4.4 CFM at 90 PSI, you get more quite a bit more airflow than the Bostitch. Weighing close to 60 pounds, you’re also getting a much heavier unit but this is mainly due to the cast iron tank for durability. 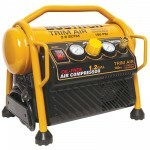 While not the most portable, you will not find a better performing air compressor for around $200. Not only is the PC1131 a workhorse, it’s relatively quiet. A great choice if you believe you need a little more oomph than the CAP1512 can provide. 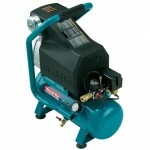 Makita is one of the most trusted names in air compressors. The MAC700 is their entry-level compressor and performance lies in between the Bostitch and Senco. Same goes for its noise level, weight, and tank size. It’s a good all-around performer and the cast iron tank means it is built to last. 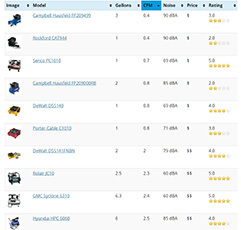 Not exceptional in any one category, the MAC700 is solid in all categories. Almost 500 reviewers on Amazon can’t be wrong.